Many years ago I wrote a blog post titled ‘What I Learned From Nigerian Spammers.’ I received a 419 scam to my inbox that was infinitely more entertaining and interesting than the typical email that promised millions for a small up-front fee to transfer millions in hidden treasure from the deceased ruler of some obscure kingdom. The authors of this particular rag were smart enough to use details that were relevant to the current news cycle; frankly, it made the whole thing a little more nefarious and compelling at the same time. Today I received an email that like the 419 scam of yore based its content in current news, or in this case, individual behaviors. Pokemon Go has taken the Internet by storm, at least for the foreseeable 5 to 10 minutes. People are trespassing, bumping into things, and occasionally causing accidents as they inhale an augmented reality; the experience is immersive and addictive which makes it the perfect catalyst for email content. What I really want to call this is social engineering, but contemporizing is close enough–email has to connect with people individually. Using content that’s regionally pertinent, like selling galoshes during a storm vs. sandals, or connecting a local sports team’s win to your brand, makes sense as a content strategy for email. Remember, you’re competing for shortening attention spans with a subject line as the point of entry for an email. Content is not just the rage, it’s the most important thing you can focus on to improve engagement in the inbox. Virgin America sent out a brilliant email a few days ago that is contemporary and socially engineered for Pokemon Go addicts while preserving the brand and presenting a fabulous call to action. Just to be clear, they’re not 419 scammers, they’re just smart marketers that saw an opportunity to use the hot Pokemon Go trend to pump up their own brand and move the needle. The marketing team at Virgin America knew exactly what they were doing. 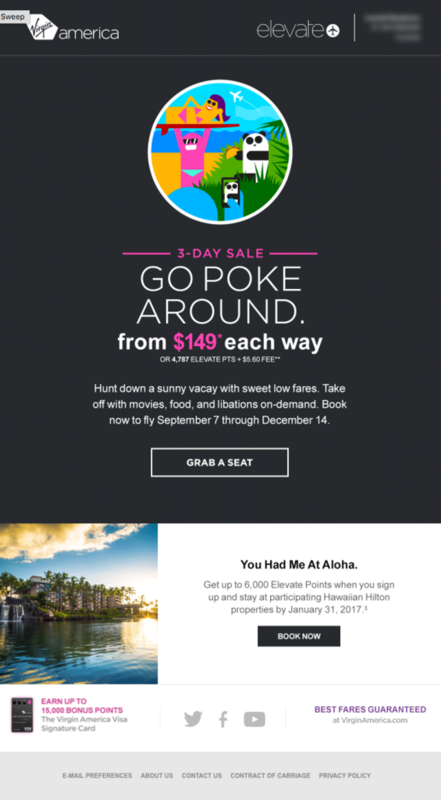 Everything from the subject line: Go poke around with seriously low fares to how they made a ‘ball/sphere’ of the image imitate Pokemon Go without fully committing to another brand. The hand with the mobile phone taking a picture of the panda character isn’t unlike the hordes of players roaming the streets looking to catch Pokemon and entomb them, Ghostbusters style (notice how I did that 😉 ) in a small ball for points. The implication seems clear: go on vacation and continue to enjoy your augmented reality, just make sure your ticket was purchased through Virgin America. The mobile revolution taught us that less is more: instead of clicking we press and tap, pinch and squeeze; these behaviors have changed how we code and send emails. Small screen sizes require that our messages are shorter and more direct, again, less is more. Primary and secondary offers are about as much as you want to pack into an email. Look for trends, fads, news, weather and other current topics, they will help keep you on the minds of your recipients, but be careful, make sure you always exercise good taste and judgement when you do this. It’s easy to harm your brand by connecting something totally unrelated or even in poor taste to your brand. Make it as personal as possible without it being creepy. Not all fads will work for all recipients. Test age and other demographic segments to understand impact and efficacy. Have fun. No seriously, have a little fun with it (and if it makes sense for your brand). If you can make someone smile they’re more likely to convert and hopefully share the content.